My favorite part of Thanksgiving Dinner is all of the delicious side dish recipes! Forget the turkey, I would rather fill my plate with stuffing, mashed potatoes and candied yams! This recipe is our family’s favorite candied yam recipe. The flavor is absolutely amazing! Boil yams for 20 minutes in a large pot, or until they are easily pierced with a fork and drain. Spray a 9x13-inch baking dish with nonstick cooking spray and spread boiled yams inside. Distribute small pieces of butter and cinnamon evenly over the yams. Sprinkle brown sugar then miniature marshmallows over yams. 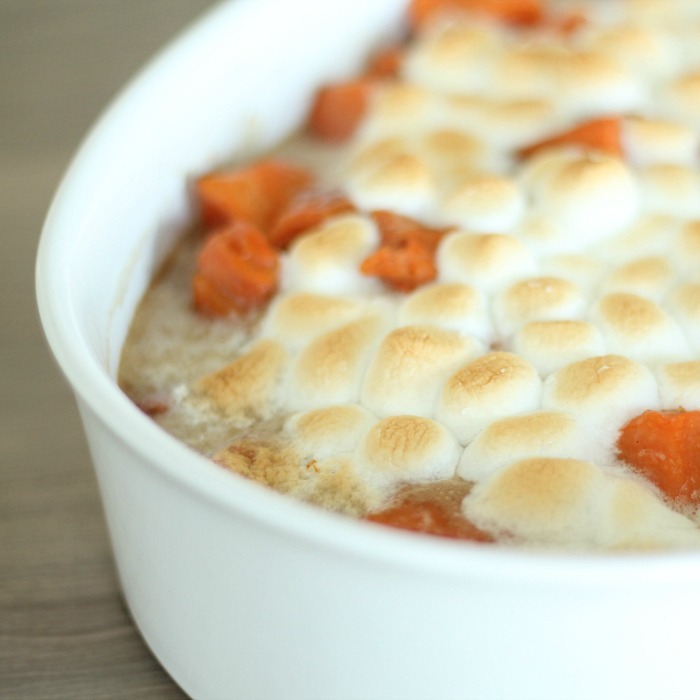 Bake in the preheated oven for 25 minutes, or until sweet potatoes are tender and marshmallows have melted. You forgot tge crushed pineapple with a bit of juice! Best yams for Thanksgiving & Christmas, a family favorite!! My husband LOVES his yams like this. I'm usually too busy eating rolls and potatoes. We're on our own for Thanksgiving this year and he told me to not forget the yams. I thought they'd be more involved than this! So happy you posted this!